Today, we have contributed a fourth World War I-themed children’s novel to Project Gutenberg. 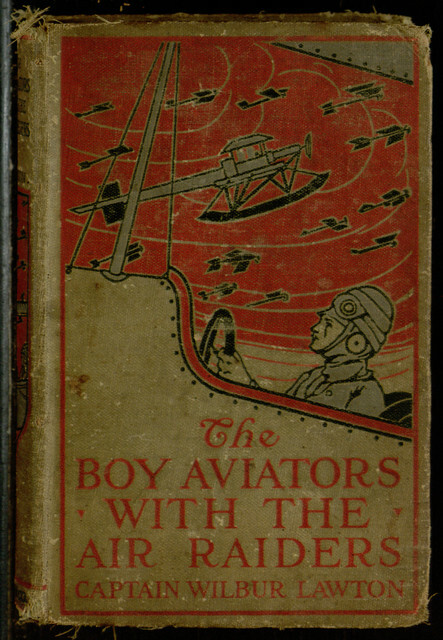 This title, The Boy Aviators with the Air Raiders, was written in the early days of the war and published in 1915, and this gives it a significantly different tone from the other three titles we have released, all of which were produced later. The books published after America’s entry in the war have a distinct flavor of propaganda about them, emphasizing patriotism and portraying Germans as distasteful stereotypes. This earlier title, produced at a time of America’s neutrality, has an entirely different tone, and indeed, neutrality features prominently in the plot. 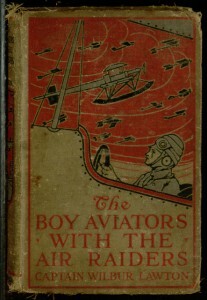 As the book begins, the titular Boy Aviators are representing a company which has produced an advanced seaplane. A prototype was sent to France before the war broke out, and while American neutrality prevents further models from being shipped, it does allow royalties to be paid on French-built replicas of the prototype. The boys are tasked with demonstrating the plane to show its value to the French government and secure a contract. Of course, German spies are desperately trying to steal or destroy the plane before this can happen! Of course, while the Germans get a surprisingly sympathetic portrayal, it would be hard to find a children’s series book of this period that didn’t feature some sort of character offensive to modern sensibilities, and in this instance, most of the cringe-inducing content arrives courtesy of Pudge, one of the heroes, but also a stereotypical “jolly fat boy,” clumsy, more cowardly than his peers, fixated on food, and prone to frequent alliterative exclamations such as “Sugar and sandwiches!” and “Tamales and terrapins!” It could be argued that even Pudge’s portrayal is, on the balance, positive, since he repeatedly performs heroic acts in defiance of his personal limitations, but his positioning as (unfunny) comic relief purely on the basis of a physical attribute is hard to ignore. As with many of its peers, Boy Aviators with the Air Raiders is interesting as a study of its period, but weak as actual entertainment. While the book certainly delivers some action-packed flying sequences as the boys prove the worth of their plane in active war zones, it has little else to offer. Its prose is unengaging and filled with long, awkward sentences, and the theme of neutrality that runs through the story eventually brings the tale to a startlingly unsatisfying conclusion, perhaps the only ending possible given the many uncertainties of an ongoing conflict. Since the entire book is available for online reading or download through Project Gutenberg, you are now free to read it and form your own conclusions. In spite of its low literary standards, it is a title worth studying as an example of an early, tentative attempt to use the novelty of an ongoing war to sell books to children.